Look. See. Observe. Gaze. Watch. How does it matter if you are looking, but are not taking ‘in’ the information, that ‘needs’ to be taken in? Regardless of the situation that we put ourselves in, if we learn to ‘see’ without labeling things, or events, or situation, or people as something, that our first hunch says, more information tends to flow in. We tend to let that come in, without sticking a post-it note on ‘that’. So it could reveal what it has to – without our effort. Next time, I need to understand something better, I will have to see, forgetting the name of the thing I see. Disclaimer: this article is more personal in nature that is more relevant to me. And not a review that you can rely on to buy, though I strongly recommend getting this book if you want to address some key points while developing your mobile app – yes the book is particular in saying that ‘mobile’ app is the way to go compared to other platforms. Also, the above link to the book is an affiliate link, just so you know. Notes: There are many sentences and phrases that I would love quoting from this book written by George Berkowski. It is not possible to give them all in here. It addresses a lot of key issues with sufficient examples on how other entrepreneurs did it. Overall, it motivates, assures, and provides some guidance on how to build a billion dollar app ourselves. That being said, although I don’t have any deep interest in publishing an app immediately, this book is definitely a reference that I am shelving today to come back later. Creating a robust name and brand from the very beginning is critical. But it’s damn hard. And it can take quite a bit of time to find something that feels just right. From the onset I would recommend a couple of strategies. First, don’t let the name hold you up from designing your app or even beginning the software development – you can refine the name in parallel. Second, don’t settle for an OK name. A great name is 10 times better than a good name. So invest the time now, because down the line there will be a million reasons why it’s close to impossible to change it. ACQUISITION: users downloading your app from a variety of channels; • ACTIVATION: users enjoying their first ‘happy’ experience on your app; • RETENTION: users coming back and using your app multiple times; • REFERRAL: users loving your app so much they refer others to download it; • REVENUE: users completing actions on your app that you’re able to monetise. Even if you’re an app, you need a website. If people Google you, they should be able to find you easily. Ideally, you want your site to focus on helping people download your app – i.e. a crisp, snappy description – and then a clear download button that links directly to the app stores you’re on. George Berkowski. How to Build a Billion Dollar App: Discover the Secrets of the Most Successful Entrepreneurs of Our Time (Kindle Locations 2058-2060). Little, Brown Book Group. Kindle Edition. important factors that you need to consider when coming up with a name: • Is your name short, catchy and memorable? Hailo is about hailing a taxi. Snapchat is about chatting, rapidly. Waze is about finding the best ways through traffic. • Is your name distinctive? Uber meant little until it became your on-demand chauffeur. If you can’t cut through the noise with a clear name, make one up. Etsy was a nonsense word, but is now synonymous with ‘marketplace for handmade goods’. • Is your name clever? Does it make people smile? The Square app allows you to ‘square up’ your bill. Pinterest allows me to ‘pin’ all the things I find interesting. • Can your name become a verb? Hailo me a taxi, Google that word. This is one of the most powerful characteristics – and one you can’t force. But you can ensure that your name is conducive to this usage. George Berkowski. How to Build a Billion Dollar App: Discover the Secrets of the Most Successful Entrepreneurs of Our Time (Kindle Locations 1532-1539). Little, Brown Book Group. Kindle Edition. Rich Dad Poor Dad – : What The Rich Teach Their Kids About Money – That The Poor And Middle Class Do Not! A classic book about thinking and dealing with money. After a lot of procrastination, I finally got to this book. I have never done this before, but I did a reading experiment with this book. And that is – don’t keep the book down until it’s done. Done reading. Done comprehending the thoughts given in the book. 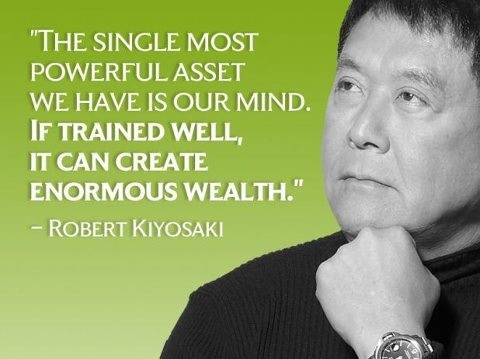 Robert Kiyosaki has given a deep thought that has to be nurtured and kept in the foremind forever. I felt the examples; scenarios given in the book were good. The idea about the mindset of money was written in such a way that it slowly found its way to being mind’s bedrock. Something I will never forget in my life. This book surely made an impact. A deep one. If there is something that made me cringe while reading the book that is stretching of the same idea over and over somewhere from the middle part of the book until the end. I felt the idea was repeated, may be with a purpose to ingrain it in our minds, over and over. I surely met its purpose, but as a reader, I expected more concrete theories. Also aside, I could be wrong, for the main point was already taught in the early part of the book and I was still looking for a further push. But yes, things could have been even better if there were methods and theories given as to how to make assets, how to read financials, what a typical day is like for people who are rich. Perhaps, that was missing from what I could decipher. Maybe I am just rambling here with a ping pong of thoughts. There were some great words with powerful insights that needed a highlight. I have given some of my highlights from the book below so I could refer them again later and revisit my learnings from this book. Beware; there could be some spoilers, though. A job is only a short-term solution to a long-term problem. Most people have only one problem in mind, and it’s short-term. It’s the bills at the end of the month, the Tar Baby. Money controls their lives, or should I say the fear and ignorance about money controls it. So they do as their parents did. They get up every day and go work for money, not taking the time to ask the question, ‘Is there another way?’ Their emotions now control their thinking, not their heads. The poor, the middle class, and the ignorant will have their lives ruined simply because they will continue to believe that money is real and that the company they work for, or the government, will look after them. Keep working boys, but the sooner you forget about needing a paycheck, the easier your adult life will be. Keep using your brain, work for free, and soon your mind will show you ways of making money far beyond what I could ever pay you. You will see things that other people never see. Most people never see these opportunities because they’re looking for money and security, so that’s all they get. The moment you see one opportunity, you’ll see them for the rest of your life. The moment you do that, I’ll teach you something else. Learn this, and you’ll avoid one of the life’s biggest traps. The assets are large enough to grow by themselves. It’s like planting a tree. You water it for years, and then one day it doesn’t need you anymore. Its roots are implanted deep enough. Then the tree provides shade for your enjoyment. My educated dad stressed the importance of reading books, while my rich dad stressed the need to master financial literacy. Rich people acquire assets. The poor and middle class acquire liabilities that they think are assets. We, adults, are often too proud to admit that something does not make sense. An intelligent adult often feels it is demeaning to pay attention to simplistic definitions. In accounting, it’s not the numbers, but what the numbers are telling you. It’s just like words. It’s not the words, but the story the words are telling you. If you want to be rich, you’ve got to read and understand numbers. Schools were designed to produce good employees instead of employers. When it comes to money, high emotions tend to lower financial intelligence. Money has a way of making every decision emotional. Starting an investment portfolio early on impacts an individual in a good way. When you want a bigger house, first buy assets that will generate the cash flow to pay for the house. The pattern of treating your home as an investment, and the philosophy that a pay raise means you can buy a larger home or spend more, is the foundation of today’s debt-ridden society. Know the difference between an asset and a liability. Once you understand the difference, concentrate your efforts on only buying income-generating assets. The problem with simply working harder is that each of these three levels (working for someone else, working for the government, working for the bank) takes a greater share of your increased efforts. You need to learn how to have your increased efforts benefit you and your family directly. Wealth is a person’s ability to survive so many numbers of days forward — or, if I stopped working today, how long could I survive? – R. Buckminster Fuller. Keep your daytime job, but start buying real assets, not liabilities or personal effects that have no real value once you get them home. Keep expenses low, reduce liabilities, and diligently build a base of solid assets. For young people who have not yet left home, it is important for parents to teach them the difference between an asset and a liability. Get them to start building a solid asset column before they leave home, get married, buy a house, have kids, and get stuck in a risky financial position, clinging to a job, and buying everything on credit. I see so many young couples who get married and trap themselves into a lifestyle that will not let them get out of debt for most of their working years. For many people, just as the last child leaves home, the parents realize they have not adequately prepared for retirement, and they begin to scramble to put some money away. Then their own parents become ill, and they find themselves with new responsibilities. Businesses that do not require my presence: I own them, but they are managed or run by other people. If I have to work there, it’s not a business. It becomes my job. 2. Stocks 3. Bonds 4. Income-generating real estate 5. Notes (IOUs) 6. Royalties from intellectual property such as music, scripts, and patents 8. Anything else that has value, produces income or appreciates, and has a ready market. Start a corporation – that is the biggest secret of the rich. Be smart, and you won’t be pushed around as much. Rich Dad knew the law because he was a law-abiding citizen and because it was expensive not to know the law. “If you know you’re right, you’re not afraid of fighting back. My highly educated dad always encouraged me to land a good job with a strong corporation. He spoke of the virtues of “working your way up the corporate ladder.” He didn’t understand that, by relying solely on a paycheck from a corporate employer, I would be a docile cow ready for milking. When I told my rich dad of my father’s advice, he only chuckled. “Why not own the ladder?” was all he said. Accounting, investing, understanding markets, Law/taxes. A corporation can do many things that an employee cannot, like pay expenses before paying taxes. That is a whole area of expertise that is very exciting. Employees earn and get taxed, and they try to live on what is left. A corporation earns, spends everything it can, and is taxed on anything that is left. It’s one of the biggest legal tax loopholes that the rich use. They’re easy to set up and are not expensive if you own investments that are producing good cashflow. For example, by owning your own corporation, your vacations can be board meetings in Hawaii. Car payments, insurance, repairs, and health-club memberships are company expenses. Most restaurant meals are partial expenses, and on and on. But it’s done legally with pre-tax dollars. We live in a litigious society. Everybody wants a piece of your action. The rich hide much of their wealth using vehicles such as corporations and trusts to protect their assets from creditors. When someone sues a wealthy individual, they are often met with layers of legal protection and often find that the wealthy person actually owns nothing. They control everything, but own nothing. The poor and middle class try to own everything and lose it to the government or to fellow citizens who like to sue the rich. They learned it from the Robin Hood story: Take from the rich, and give it to the poor. It is not the purpose of this book to go into the specifics of owning a corporation. But I will say that if you own any kind of legitimate assets, I will consider finding out more about the benefits and protection offered by a corporation as soon as possible. There are many books written on the subject that will detail the benefits and even walk you through the steps necessary to set up a corporation. Garret Sutton’s (see: and Grow Rich) books on corporations provide wonderful insight into the power of personal corporations. Financial IQ is actually the synergy of many skills and talents. I would say it is the combination of the four technical skills listed above that make up basic financial intelligence. If you aspire to great wealth, it is the combination of these skills that will greatly amplify your financial intelligence. Business owners with Corporations earn, spend, and pay taxes. Employees who work for Corporations earn, pay taxes, and spend (with what is left of them). As part of your overall financial strategy, I recommend that you learn about the protection that legal entities can provide for businesses and assets. We all have tremendous potential, and we all are blessed with gifts. Yet the one thing that holds all of us back is some degree of self-doubt. It is not so much the lack of technical information that holds us back, but more the lack of self-confidence. Some are more affected than others. If fear is too strong, the genius is suppressed. In my classes, I strongly urge students to learn to take risks, to be bold, and to let their genius convert that fear into power and brilliance. If you are the kind of person who is waiting for the right thing to happen, you might wait for a long time. It’s like waiting for all the traffic lights to be green for five miles before you start your trip. “They are one skill away from great wealth.” What this phrase means is that most people need only to learn and master one more skill and their income would jump exponentially. I have mentioned before that financial intelligence is a synergy of accounting, investing, marketing, and law. Combine those four technical skills and making money with money is easier than most people would believe. When it comes to money, the only skill most people know is to work hard. Education is more valuable than money, in the long run. But for those of you who might be on the fence when it comes to the idea of working to learn something new, I offer this word of encouragement: Life is much like going to the gym. The most painful part is deciding to go. Once you get past that, it’s easy. There have been many days I have dreaded going to the gym, but once I am there and in motion, it is a pleasure. After the workout is over, I am always glad I talked myself into going. The world is filled with talented poor people. All too often, they’re poor or struggle financially or earn less than they are capable of, not because of what they know, but because of what they do not know. They focus on perfecting their skills at building a better hamburger rather than the skills of selling and delivering the hamburger. Maybe McDonald’s does not make the best hamburger, but they are the best at selling and delivering a basic average burger. Poor dad wanted me to specialize. That was his view on how to be paid more. My educated dad worked harder and harder the more competent he became. He also became more trapped the more specialized he got. Although his salary went up, his choices diminished. Soon after he was locked out of government work, he found out how vulnerable he really was professionally. It is like professional athletes who suddenly are injured or are too old to play. Their once high-paying position is gone, and they have limited skills to fall back on. Rich dad encouraged Mike and me to know a little about a lot. He encouraged us to work with people smarter than we were and to bring smart people together to work as a team. Today it would be called a synergy of professional specialties. If you have little money and you want to be rich, you must first be focused, not balanced. If you look at any successful person, at the start they were not balanced. Balanced people go nowhere. They stay in one spot. To make progress, you must first go unbalanced. Just look at how you make progress walking. There are many people in the world of money, finances, and investments who have absolutely no idea what they’re talking about. Most people in the money industry are just spouting off sales pitches like used-car salesmen. When you know you are ignorant in a subject, start educating yourself by finding an expert in the field or a book on the subject.